I just read a blog post from my former “partner in clean,” Allie, about another challenge she is doing. She calls it “I Dare Allie.” The idea is to do one new thing every day for a year. Some are fun (first gin martini) some are sweet (first date with her son) some are practical (first time changing the air conditioning filters in the house – Pat would be thrilled!). It’s a really neat idea. At the end of her post, she asked people to comment on new thing they’ve done recently. I sort of drew a blank. Then I remembered learning how to use the weights machines at the gym, and the homemade granola bars I made for the first time this week (recipe coming next week). I thought leaving the comment “I puked in a snowbank” would have been vulgar, and I totally forgot about finally playing Cards Against Humanity. 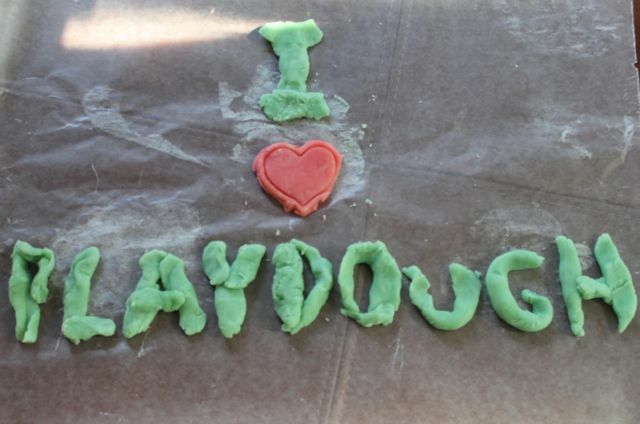 But what I can’t believe I forgot about, because I was just about to sit down and write this post, was that yesterday I made homemade playdough for the first time. So I don’t know what possessed me yesterday, but while we were at Target, I picked up Cream of Tartar for the recipe. 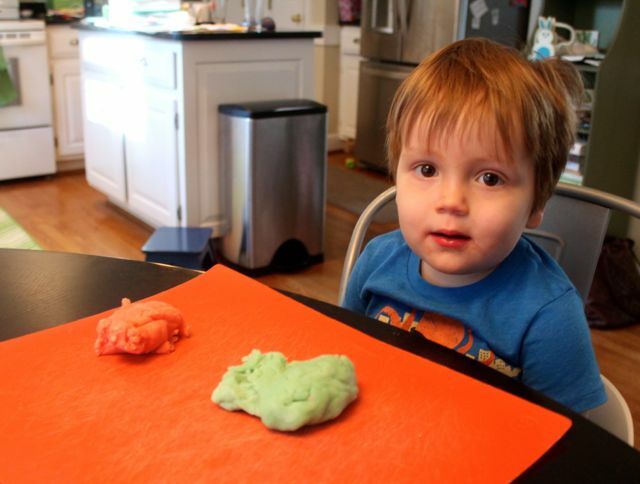 Then, while Rory was napping, I told Noah we were going to make playdough. Well, it was so easy, it would have been embarrassing if I hadn’t made it. We whipped up the first batch (a lovely mint green) so quickly, there was no reason to not make a second batch. Rory woke up right as we finished, so it was cooled and ready to play with when Rory came downstairs. It kept them busy for maybe 20 minutes, and yes, Rory did eat some of it. But it was so easy, it was worth it. 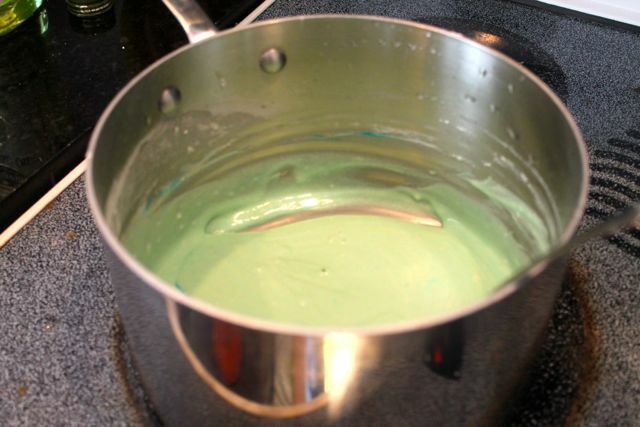 1) Coat a medium saucepan with nonstick spray. (I forgot to do this, it was fine.) 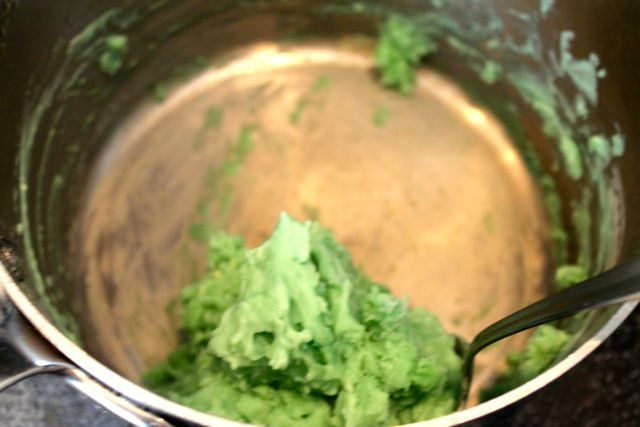 Dump all ingredients into pot and stir until well blended. 2) Cook over medium heat, stirring until it forms a large ball. 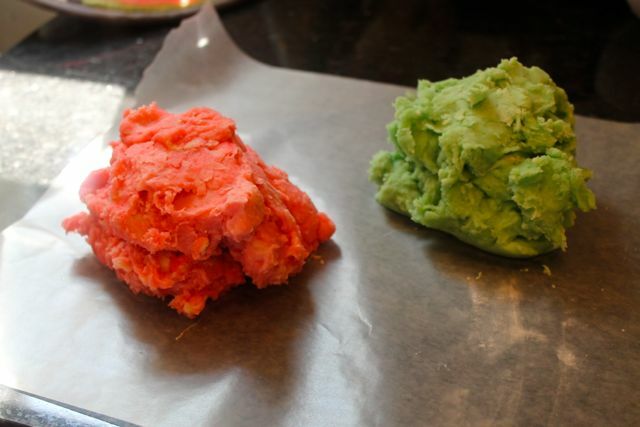 3) As soon as a ball forms, take it off the heat and dump onto wax paper. 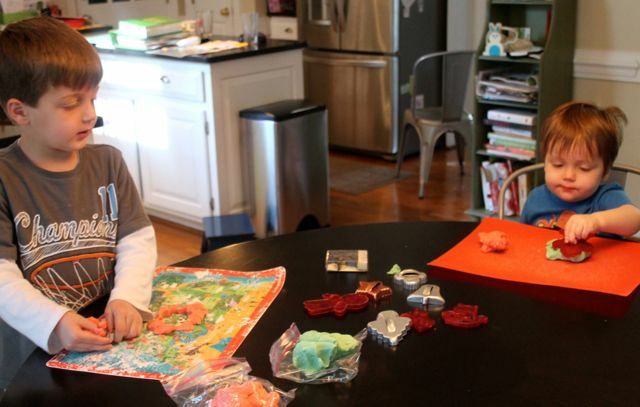 How can I earn my next Stay at Home Mom badge? Give me ideas for DIY projects as easy as this one that will keep the kids occupied for at least 20 minutes. Thanks! Thank you so much for the shout out! For the record, I think puking in a snow bank totally counts as a first:)! Um, especially if it’s after a gin martini.